Tavern at the Falls at Highland Falls Golf Course will be closed during overseed, starting Thursday, September 27, to Saturday, September 29. Pedego Electric Bikes representative Brad Matos instructs Randy Broome how to work the bike’s gears. Lynda Brandt comes in from a test ride. Video by Stu Gershon/Link. Last Saturday morning I was in the Desert Vista Fitness Center and a gentleman walked in. From across the room a woman called out, “Henry, how are your kidney stones?” Was that a way to start the day in our senior retirement community or what? 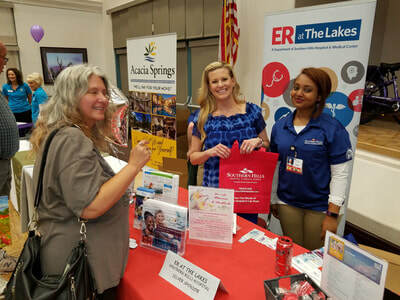 It’s normal conversation around here, but it also reminded me that I had to cover our annual Health Fair, happening in the next building over. As I started down the corridor to the ballroom I saw a line of about 50 people lining up for the shot clinic. Their wait wasn’t long because there were about 15 technicians administering the flu and pneumonia shots. 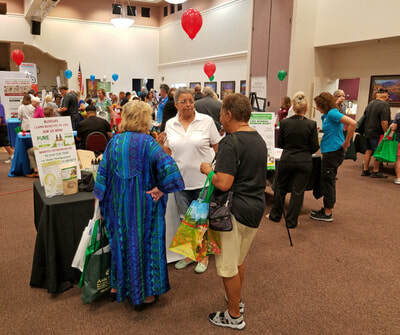 At about 9:30 a.m. there were already about 200 people visiting the various vendor booths that included assisted-living communities, nursing homes, a 24-hour emergency room and even a table from City Hall with Las Vegas City Councilman Stavros Anthony greeting residents and answering questions. Three members of our Fitness Department staff, Director Pam Shields, and Jessie Miles and Charli Douglass stood under an arc of balloons calling out raffle numbers to present to prizes to lucky residents. For the first time I can recall, an outdoor exhibit was set up. Under a tent, Pedego Electric Bikes featured attendants managing a test ride course where residents got a chance to take the bikes out for a spin. 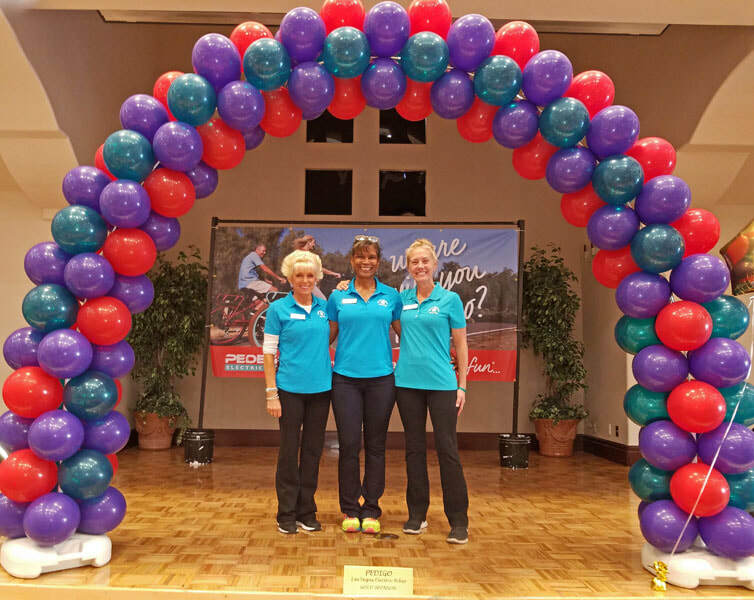 According to Pam Shields, the fair welcomed more than 500 attendees. The parking lot was packed, the ballroom was packed and the shot clinic line was getting long and moving steadily. 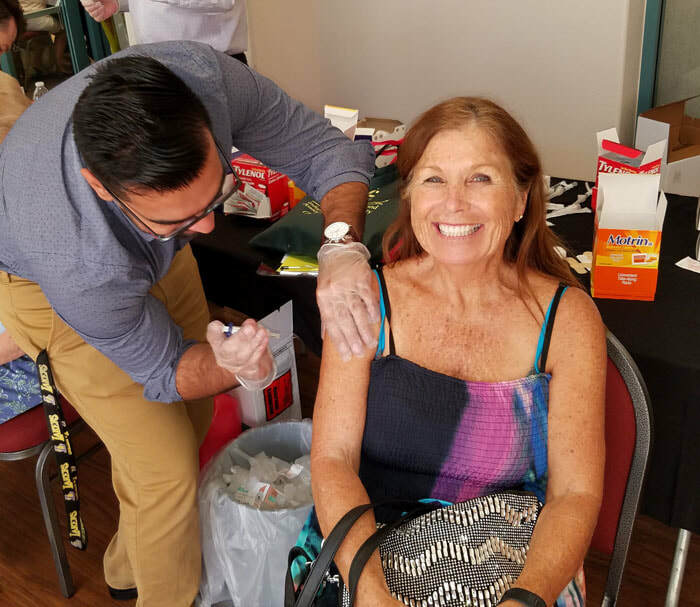 Pam later confirmed that 415 flu shots were administered. 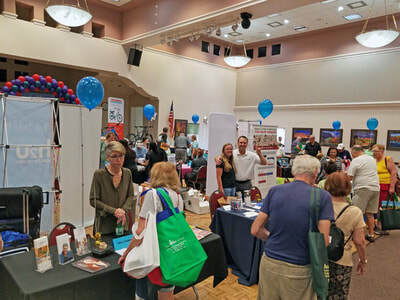 Clockwise from top left, SCSCAI Fitness Specialists Charli Douglass, left, and Jessie Miles, surround Fitness Director Pam Shields on the Desert Vista Ballroom stage; residents enjoy meeting vendors and learning about new health and fitness products; Gail Grundy gets a flu shot from Manish Kumar of Von’s vaccination clinic. Photos by Stu Gershon/Link. Beth Gershon as Mary-Katelen Ashlee; Ooh La La gives instructions to diners on how to play the murder mystery game; residents enjoy the show; June Evans offers a sneak peek at the buffet before the event gets underway. 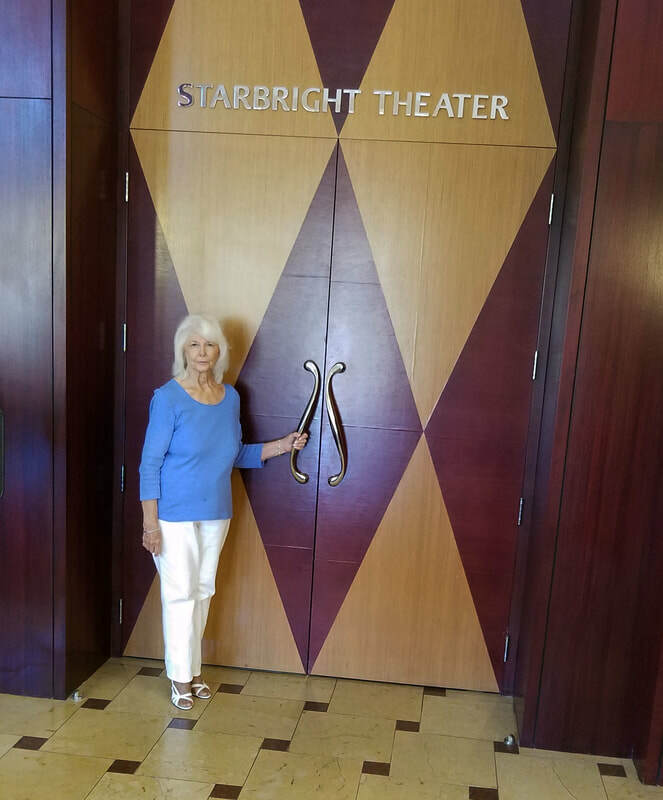 Gloria Ouano welcomes residents to an informal classic film group she’s organized at the Starbright Theatre. Photo by Stu Gershon/Link. On Friday, September 21, a group of residents organized as a classic film group gathered to watch the 1962 courtroom drama “To Kill a Mockingbird” at The Starbright Theatre. The film is part of the Starbright Theatre’s free film series. Nearly 40 people attended the showing. After the movie, everyone in the group was invited to meet for lunch at The Summit Restaurant to enjoy a bite and critique the movie. Residents, who started lunch around 1 p.m., talked until 3 p.m. It was a great way to spend an afternoon. The next movie scheduled for the informal meeting is Friday, October 12, where the movie will be “The Birds,” by Alfred Hitchcock. After that, the classic film group plans to meet on the third Friday of the month at 11 a.m. Be sure to check the Link for the coming attraction. 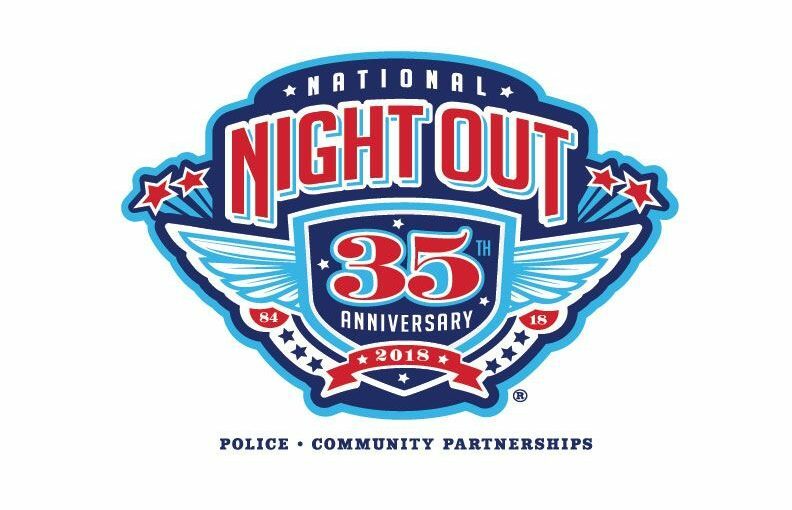 The Neighborhood Watch/Community Preparedness Committee will present National Night Out next week on Tuesday, October 2, 5-7 p.m., on the Desert Vista parking lot. The event is part of a national partnership among the Las Vegas Metropolitan Police Department and communities across the country to take a stand for neighborhood safety. Join your friends and get to know your neighbors during this outdoor fete. Enjoy music, hot dogs, chips, cookies, soda and more as Sun City comes together to celebrate community spirit. “We’re putting a lot of fun and safety fundamentals on a jam-packed, two-hour menu for Sun City’s National Night Out extravaganza,” said Sandy Krause, NNO sub-committee chairwoman. 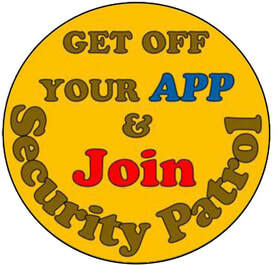 “NNO should be marked on everyone’s special events calendar. 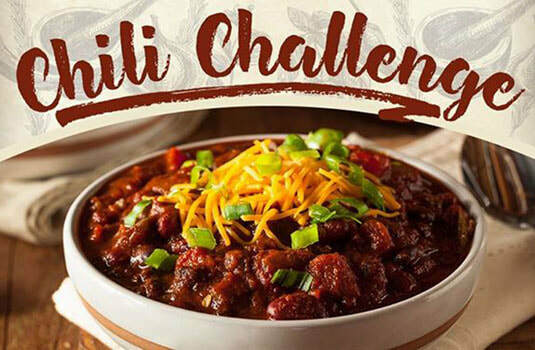 Whether you are a great home cook, or at least fancy yourself one, consider putting your culinary skills to the test against 28 of Sun City’s finest chefs when the Residents’ Forum presents its third annual Chili Challenge. 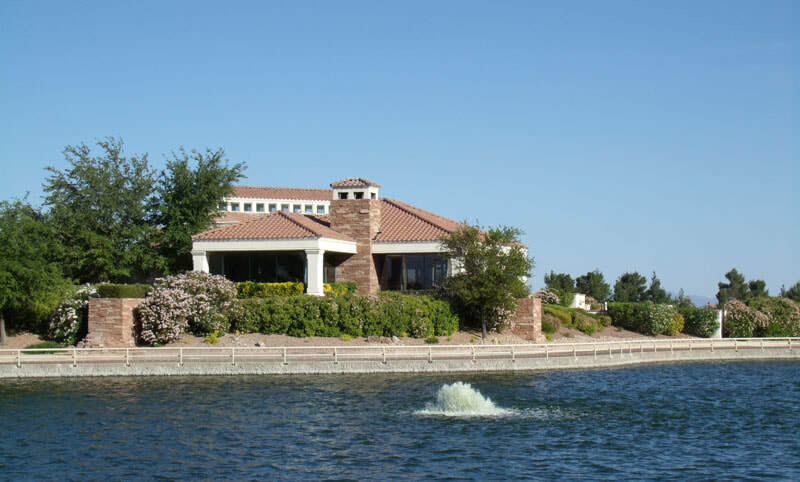 The event takes place Wednesday, October 10, 7-8:30 p.m., at Desert Vista. Spicy, con carne, with beans or creamy, it’s all about the chili and you get to pick the winner. Each resident gets a ticket at the door that represents their vote. 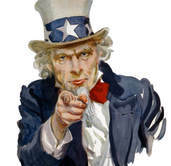 To put you chili on the line, contact Julie Zerbel at 512-775-1309 or juliezerbel@yahoo.com. Pedego Electric Bikes representative Brad Matos instructs Randy Broome how to work the gear's during the 2018 SCSCAI Health Fair. Photo by Stu Gershon/Link.